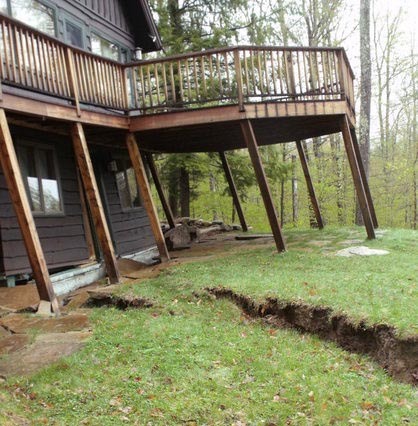 For more than a month now, a "slow-motion landslide" near the New York/Vermont border has been dismantling a small town, day by day, square foot by square foot. The landslide is "oozing slowly," New York state geologist Andrew Kozlowski explains to National Public Radio, "no faster than three feet per day. But it's so big that scientists have been arriving from all over the country to study it." [Image: Photo by Brian Mann/North Country Public Radio, courtesy of National Public Radio]. The entire landslide is 82 acres in extent—though there's not, in fact, enough data to know for certain "how wide this event is"—making it the largest landslide in New York's recorded history. However, "gathering good data has been tricky, in part because the terrain is incredibly treacherous, with trees toppling and boulders kicking loose." It's the slow-motion landslide as future game environment, or Inception's dream-sector physics applied to the surface of the earth: for instance, when the rocks let loose, Kozlowski points out, "you hear a thumping, tumbling sound and you sort of look up and catch a glimpse and you hear them hitting tree trunks as they're moving downslope. And so you just try to get between a tree and where you think they're coming." As the Albany Times Union adds, for one family, "the first clue that something was wrong came May 6, after [they] returned from a family visit to California." While they were gone, a carpenter had added a laundry room near their bedroom, and Jim noticed the bedroom door would no longer shut properly. Then Charity saw a tree outside their bedroom window was tilting at a weird angle and a crack in the ground near a place under the deck where she kept gardening equipment. [Film: An otherwise unrelated time-lapse video of the Snake River Landslide in Wyoming, spotted via Pruned]. In northern New York and Vermont, the disaster has developed slowly. Weeks of torrential rains have glutted Lake Champlain, flooding hundreds of miles of coastline. Now, in the mountain village of Keene Valley, N.Y., all that water has triggered a massive landslide that is slowly destroying a neighborhood. In the forthcoming issue of Bracket, on the subject of "soft systems," Jared Winchester and Viktor Ramos propose a semi-mobile village of "landslide mitigation" structures. "The houses tether themselves to the slopes using soil-nailing technologies," the architects write, "then rotate, dip and pivot in response to slope movement. As the soil slips, the house slows down the process through its distortion." Images of their project will be available when Bracket hits the street later this year. [Image: The "Retreating Village" by Smout Allen, from Augmented Landscapes]. The NPR piece is not without human tragedy, of course, as we learn that whole houses have been condemned, demolished, or otherwise emptied by their owners and left to collapse, uninsured, as the village is abandoned. But is there, as Winchester and Ramos suggest, or as Smout Allen's "Retreating Village" project indicates, an architecture appropriate for these dynamic terrestrial conditions? What sort of building would it be, in any case, like some wheeled arachnid or stilted earthship, that could ride the waves of a sliding planet, stretched, tested, and reconfigured from below by geotechnical shifts? Should such buildings have hulls or foundations—and would architects have more to learn more from seismic engineering or from shipbuilding? Would the structures be vehicles or buildings? Would a pilot's license be operationally required as a condition of this groundless dwelling? More simply, what happens to architecture when solid earth becomes more like the ocean? (Earlier on BLDGBLOG: Toward the city come hills).